ABB Australia announces a new robot family in a smaller form factor to address the needs of modern materials handling and machine tending industries. ABB’s new IRB 1200 robot family offers flexibility, ease of use, compactness and short cycle times. The new design is packed with features that allow for 15% smaller cells with 10% shorter cycle times. The compact package has a large useable working area leading to shorter cycles. Integration is simplified with four air ducts, 10 customer signals and Ethernet, all routed inside the robot from flange to foot. IP 67 protection is available optionally. The IRB 1200 family comes in two variants, both mountable at any angle. The 700mm reach variant can carry a payload of up to 7kg, while the longer reach 900mm variant can carry up to 5kg of payload. The two variants can handle a wide range of applications and are cost effective due to commonality of parts. 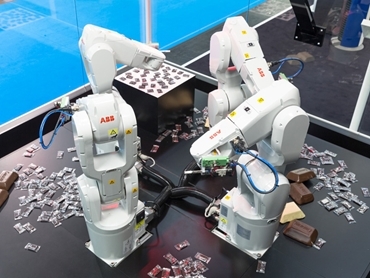 Phil Crowther, Small Robots Product Manager at ABB commented that the IRB 1200 is an outcome of their exhaustive market analysis and development process, which resulted in a compact robot that allows for maximisation of useable working range and operation as close to the work piece as possible. The IRB 1200’s functional form factor is not merely a cosmetic enhancement with its smooth surfaces allowing easy cleaning and maintenance in environments such as CNC machine tending in the food industry. ABB’s IRB 1200 is designed to allow both electrical and air connections to be made to the robot via side ports or from beneath the base. An Ethernet port simplifies integration with other equipment such as the ABB Integrated Vision, powered by Cognex. These connections are routed internally on the robot from very close to the wrist flange, all the way to the foot, thus enhancing the compactness of the package. Since the IRB 1200 has no offset in axis two, resulting in a longer stroke than other robots, the robot can be placed very close to the work piece and still be functional. One particular benefit of this long stroke is that it allows for a much more compact installation when the robot is mounted on the ceiling inside a small cell, such as in electronics machining or polishing applications. Paolo Maggi, Product Specialist at ABB in Australia says the IRB 1200 is the perfect alternative for ABB’s IRB 120 in small parts assembly, offering a smart choice for small part handling and assembly applications with its speed and large working envelope. When combined with ABB Integrated Vision, the IRB 1200 offers a powerful solution that can be successfully deployed in a variety of applications and industries.